File Photo: Wheelersburg remained the second overall team in the newest AP poll released Monday afternoon. 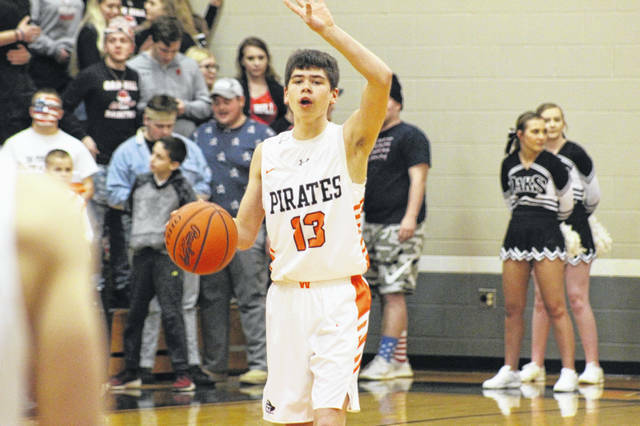 PORTSMOUTH – The fifth version of the Ohio high schools boys’ basketball AP poll was released on Monday, and it once again featured the Wheelersburg Pirates. A road win over Waverly locked the Pirates (18-0, 11-0 SOC II) into the second ranked spot in the Division III for the fifth straight week behind only Archbold (17-0) for the top spot in the state. Wheelersburg received three first place votes in this week’s poll, the same number as a week ago, while receiving 176 poll points compared to Archbold’s 219. The Pirates will finish out their regular season with home games against Portsmouth West on Friday, Greenup County on Saturday, South Webster on Tuesday, and a road trip to Lucasville on Friday to face the Indians in hopes of finishing their regular season undefeated at 22-0 heading into the postseason. Eastern Pike comes into this week’s Division III AP poll ranked tenth, dropping two spots from their place at eight a week ago, despite picking up two wins over Notre Dame and Columbus Africentric.